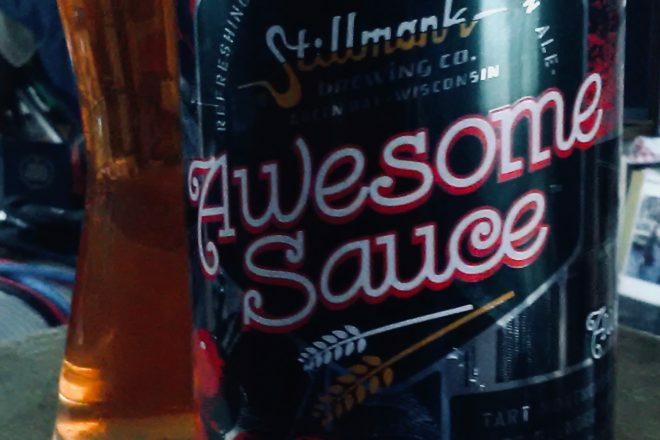 My daughter Clare, who lives in the Green Bay area, came for a visit recently bearing a sixer of Awesome Sauce from Stillmank Brewing of Green Bay. And, oddly enough, it was my first experience with Awesome Sauce. I assure you, it will not be my last. What a very yummy and refreshing beer. Owner/brewmaster Brad Stillmank adds tart Montmorency cherries and apple cider – both fruits coming from Door County – to a light American ale. The result is a delightfully fruity, refreshing beer. The experience begins with the exquisite aroma of Montmorency cherries. There is something about the smell of cherries that makes you glad to be alive. It pours with a lovely rosy hue topped by a healthy, white head. And then there’s the taste. The brightness of the tart cherries and backup apple flavor are forward, but, ultimately, the carbonation combined with that fruity goodness can’t help but put a smile on your face. I am drinking this in the dead of winter – which is April here in Door County – and it obviously was intended as a summer brew, but, of course, Clare knows we need not abide by bourgeois rules. We drink what we like when we like, and, truthfully, this bright, cherry summer beer cuts through the darkness of the night and the darkness that has descended on my soul as I find myself suddenly deeply entwined in the police state. But that is another story for another time. As with everything I’ve had from Stillmank, Awesome Sauce is awesome. Brewmeister Stillmank must have enjoyed working with apples, for he tells me this year he will be releasing a line of ciders with apples from Seaquist of Door County. One iteration will include, he told me, another Wisconsin fruit – the cranberry – for a cran-apple cider. And, yes, despite its name, the cranberry is a fruit, not a berry. In fact, like blueberries, cranberries grow on epigynous plants and so are known as false berries. But cheers to Clare for turning me on to this satisfying, fruity ale.